Christian Artist Groups of 2016-2017! From praise and worship, to bluegrass, to a Capella, to country gospel, to the great hymns of old, The McNeills truly have something that everyone can enjoy - bridging the generation gaps with their unique style, variety of music and lineup. It's often said when talking about music that theres nothing sweeter than family harmony. With a family of 12, ranging from 50 to 5 years of age, The McNeills are living up to that belief. 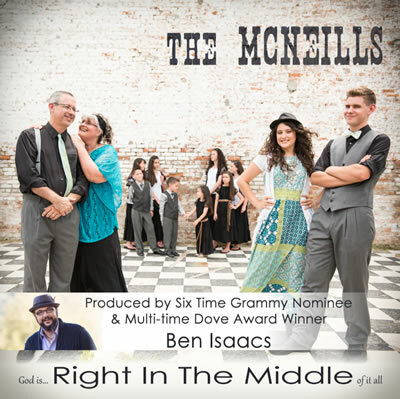 Dad (bass/piano), Mom (mandolin, penny whistle), the oldest daughter (guitar) and the oldest son (fiddle/cajone) make up the main vocal group, but at different points in a concert, ALL of The McNeills join in for a concert that you won't forget. The group has been garnering attention across the nation, going into churches, singing at festivals and conventions, and being broadcast across the US on radio, as well as across the world with their viral video. Joined up with Grammy Award Winning Producer and gospel singer, Ben Isaacs of The Isaacs, for their latest Right In The Middle project. Became one of the most viewed Christian Artist Groups (including all christian genres) with their viral Silo Series video of What A Friend We Have In Jesus - a rare occurrence in Gospel Music, and virtually unheard of for such a new group. For the McNeills' current tour schedule, please visit their website at McNeillMusic.com.